Angel Window is one of the most popular of the Lembeh island sites, this is a twin-peaked pinnacle that comes within a meter of the surface. A large cave offers a swim-through for divers on the deep end of the pinnacle, from 24 metres down to 32 metres in depth. One side is a Coral slope leveling out onto a sand flat at 15 metres. On the other side is a wall to a shelf at 8 metres, then a small plateau and another drop-off, down to 20-32 metres. This colourful site offers schooling fish, numerous Pygmy Seahorses (including the new, unofficially-named Hippocampus pontohi), Leaf Scorpionfishes, reef Octopuses, Cuttlefishes, Nudibranchs and much more. This is the most popular of the island-side sites. This site got its name from the sunlight that shines through the cave opening in the early morning, like a window to the light of angels. Angel's window gives you the chance to do a bit of reef diving, if, during your stay, you are growing tired of black sand, among some of the most amazing and bizarre, rare creatures on the planet. 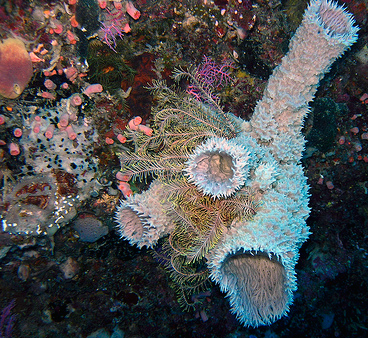 More than just a change of scene, however, this site is in fact a beautifully decorated pinnacle whose tip lies just below the surface, off Lembeh Island. Representing a break from the black sand sites that typify Lembeh, Angel's Window is a reef dive around a submerged pinnacle cloaked in orange and green soft corals, sponges and gorgonian sea fans. You can expect to encounter batfish and schools of angelfish as you work your way around the pinnacle. The eponymous window is a swim-through at around 25m which is covered in crinoids and featherstars. Keep an eye out for pygmy seahorses on the gorgonians, red octopus and an array of nudibranchs.